Bluegrass music is a genre of American roots music that developed in the 1940s in the United States Appalachian region. The genre derives its name from the band Bill Monroe and the Blue Grass Boys. Bluegrass has roots in traditional English, Irish, and Scottish ballads and dance tunes, and by traditional African-American blues and jazz. The Blue Grass Boys played a Mountain Music style that Bill learned in Asheville, North Carolina from bands like Wade Mainer's and other popular acts on radio station WWNC. It was further developed by musicians who played with him, including 5-string banjo player Earl Scruggs and guitarist Lester Flatt. Bluegrass pioneer Bill Monroe characterized the genre as: "Scottish bagpipes and ole-time fiddlin'. It's Methodist and Holiness and Baptist. It's blues and jazz, and it has a high lonesome sound." Bluegrass features acoustic string instruments and emphasizes the offbeat. 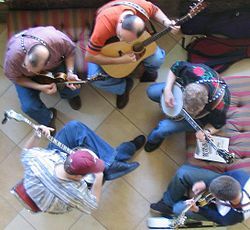 Notes are anticipated in contrast to laid back blues where notes are behind the beat, which creates the higher energy characteristic of bluegrass. In bluegrass, as in some forms of jazz, one or more instruments each takes its turn playing the melody and improvising around it, while the others perform accompaniment; this is especially typified in tunes called breakdowns. This is in contrast to old-time music, in which all instruments play the melody together or one instrument carries the lead throughout while the others provide accompaniment. Breakdowns are often characterized by rapid tempos and unusual instrumental dexterity and sometimes by complex chord changes. There are three major subgenres of bluegrass. Traditional bluegrass has musicians playing folk songs, tunes with traditional chord progressions, and using only acoustic instruments, with an example being Bill Monroe. Progressive bluegrass groups may use electric instruments and import songs from other genres, particularly rock & roll. Examples include Cadillac Sky and Bearfoot. Another subgenre, bluegrass gospel, uses Christian lyrics, soulful three- or four-part harmony singing, and sometimes the playing of instrumentals. A newer development in the bluegrass world is Neo-traditional bluegrass; exemplified by bands such as The Grascals and Mountain Heart; bands from this subgenre typically have more than one lead singer. Bluegrass music has attracted a diverse following worldwide. Unlike mainstream country music, bluegrass is traditionally played on acoustic stringed instruments. The fiddle, five-string banjo, guitar, mandolin, and upright bass (string bass) are often joined by the resonator guitar (also referred to as a Dobro) and (occasionally) harmonica or Jew's harp. This instrumentation originated in rural dance bands and is the basis on which the earliest bluegrass bands were formed. The guitar is now most commonly played with a style referred to as flatpicking, unlike the style of early bluegrass guitarists such as Lester Flatt, who used a thumb pick and finger pick. Banjo players often use the three-finger picking style made popular by banjoists such as Earl Scruggs. Fiddlers frequently play in thirds and fifths, producing a sound that is characteristic to the bluegrass style. Bassists almost always play pizzicato, occasionally adopting the "slap-style" to accentuate the beat. A bluegrass bass line is generally a rhythmic alternation between the root and fifth of each chord, with occasional walking bass excursions. Instrumentation has been a continuing topic of debate. Traditional bluegrass performers believe the "correct" instrumentation is that used by Bill Monroe's band, the Blue Grass Boys (guitar, mandolin, fiddle, banjo and bass). Departures from the traditional instrumentation have included dobro, accordion, harmonica, piano, autoharp, drums, electric guitar, and electric versions of other common bluegrass instruments, resulting in what has been referred to as "newgrass." Apart from specific instrumentation, a distinguishing characteristic of bluegrass is vocal harmony featuring two, three, or four parts, often with a dissonant or modal sound in the highest voice (see modal frame), a style described as the "high, lonesome sound." Commonly, the ordering and layering of vocal harmony is called the "stack". A standard stack has a baritone voice at the bottom, the lead in the middle (singing the main melody) and a tenor at the top; although stacks can be altered, especially where a female voice is included. Alison Krauss and Union Station provide a good example of a different harmony stack with a baritone and tenor with a high lead, an octave above the standard melody line, sung by the female vocalist. However, by employing variants to the standard trio vocal arrangement, they were simply following a pattern existing since the early days of the genre. The Stanley Brothers utilized a high baritone part on several of their trios recorded for Columbia records during their time with that label (1950–1953). Mandolin player Pee Wee Lambert sang the high baritone above Ralph Stanley's tenor, both parts above Carter's lead vocal. This trio vocal arrangement was variously used by other groups as well. In the 1960s Flatt and Scruggs often added a fifth part to the traditional quartet parts on gospel songs, the extra part being a high baritone (doubling the baritone part sung in the normal range of that voice; E.P. Tullock [aka Cousin Jake] providing the part). The use of a high lead with the tenor and baritone below it was most famously employed by the Osborne Brothers who first employed it during their time with MGM records in the latter half of the 1950s. This vocal arrangement would be the home aspect of the Osbornes' sound with Bobby's high, clear voice at the top of the vocal stack. Bluegrass tunes can largely be described as narratives on the everyday lives of the people whence the music came. Aside from laments about loves lost, interpersonal tensions and unwanted changes to the region (e.g., the visible effects of mountaintop coal mining), bluegrass vocals frequently reference the hard-scrabble existence of living in Appalachia and other rural areas with modest financial resources. Some protest music has been composed in the bluegrass style, especially concerning the vicissitudes of the Appalachian coal mining industry. Railroading has also been a popular theme, with ballads such as "Wreck of the Old 97" and "Nine Pound Hammer" (from the legend of John Henry) being exemplary. Bluegrass artists use a variety of stringed instruments. Bluegrass, as a distinct musical form, developed from elements of old-time music and traditional music of the Appalachian region of the United States. The Appalachian region was where many English and Ulster-Scots immigrants settled, bringing with them the musical traditions of their homelands. Hence the sounds of jigs and reels, especially as played on the fiddle, were innate to the developing style. Black musicians, meanwhile, brought the iconic banjo to Appalachia. Much later, in 1945, Earl Scruggs would develop a three finger roll on the instrument which allowed a rapid fire cascade of notes that could keep up with the driving tempo of the new bluegrass sound. Settlers from Britain and Ireland arrived in Appalachia during the 18th century, and brought with them the musical traditions of their homelands. These traditions consisted primarily of English and Scottish ballads—which were essentially unaccompanied narrative—and dance music, such as reels, which were accompanied by a fiddle. Many older bluegrass songs come directly from the British Isles. Several Appalachian bluegrass ballads, such as "Pretty Saro", "Cuckoo Bird" and "House Carpenter", come from England and preserve the English ballad tradition both melodically and lyrically. Others, such as "The Two Sisters", also come from England; however, the lyrics are about Ireland. Some bluegrass fiddle songs popular in Appalachia, such as "Leather Britches", and "Pretty Polly", have Scottish roots. The dance tune "Cumberland Gap" may be derived from the tune that accompanies the Scottish ballad "Bonnie George Campbell". The music now known as bluegrass was frequently used to accompany a rural dancing style known as buckdancing, flatfooting or clogging. As the bluegrass sound spread to urban areas, listening to it for its own sake increased, especially after the advent of audio recording. In 1948, what would come to be known as bluegrass emerged as a genre within the post-war country/western-music industry, a period of time characterized now as the golden era or wellspring of "traditional bluegrass." From its earliest days, bluegrass has been recorded and performed by professional and amateur musicians alike. Although amateur bluegrass musicians and trends such as "parking-lot picking" are too important to be ignored, it is touring musicians who have set the direction of the style. Radio stations dedicated to bluegrass have also proved influential in advancing the evolution of the style into distinctive subgenres. Bluegrass was initially included in the category of folk music and later changed to hillbilly. In 1948, bluegrass was placed under the country/western heading for radio airplay charting. All four of the seminal bluegrass authors - Artis, Price, Cantwell and Rosenberg - described bluegrass music in detail as originating in style and form, in one form or another, between the 1930s and mid-1940s. However, the term "bluegrass" did not appear formally to describe the music until the late 1950s, and did not appear in Music Index until 1965 (Kretzschmar, 1970). The first entry in Music Index mentioning "bluegrass music" directed the reader to "see Country Music; Hillbilly Music" (Kretzschmar, 1970, p. 91). Music Index maintained this listing for bluegrass music until 1986. The first time bluegrass music had its own entries in Music Index was 1987 (Stratelak, 1988). The topical and narrative themes of many bluegrass songs are highly reminiscent of folk music. Many songs that are widely considered to be bluegrass are in reality older works legitimately classified as folk or old-time music that are performed in the bluegrass style. The interplay between bluegrass and folk forms has been academically studied. Folklorist Dr. Neil Rosenberg, for example, shows that most devoted bluegrass fans and musicians are familiar with traditional folk songs and old-time music and that these songs are often played at shows, festivals and jams (Rosenberg, 1985). "Bluegrass" is a common name given in America for grass of the Poa genus, the most famous being Kentucky bluegrass. A large region in central Kentucky is sometimes called the Bluegrass region (although this region is west of the hills of Kentucky). Exactly when the word "bluegrass" itself was adopted to label this form of music is not certain, but is believed to be in the late 1950s. It was derived from the name of the seminal Blue Grass Boys band, formed in 1939 with Bill Monroe as its leader. Due to this lineage, Bill Monroe is frequently referred to as the "father of bluegrass". First generation bluegrass musicians dominated the genre from its beginnings in the mid-1940s through the mid-1960s. This group generally consists of those who were playing during the "Golden Age" in the 1950s, including Bill Monroe and his Blue Grass Boys, the Stanley Brothers, Lester Flatt and Earl Scruggs with the Foggy Mountain Boys, Hylo Brown and The Timberliners, Reno and Smiley, Lonesome Pine Fiddlers, Jim and Jesse, Jimmy Martin and the Osborne Brothers, Red Allen (who also recorded with the Osborne Brothers for MGM in the mid-fifties), Mac Wiseman, Mac Martin and the Dixie Travelers, Carl Story and his Rambling Mountaineers, Buzz Busby, The Lilly Brothers, Bill Clifton and Jim Eanes, and the Country Gentlemen - one of the first bands to include material from outside the usual corpus of bluegrass music. A second generation of bluegrass musicians began performing, composing and recording in the mid-to late-1960s, although many had played in first–generation bands from a young age. Some bluegrass musicians in this group are Jimmy Martin, Doc Watson, J. D. Crowe, Doyle Lawson, Sam Bush, Béla Fleck, John Hartford, Jerry Douglas, Norman Blake, Frank Wakefield, Bill Keith, Del McCoury, Tony Rice, and the pioneering female duo Hazel Dickens & Alice Gerrard. As they refined their craft, the New Grass Revival, Seldom Scene, The Kentucky Colonels, and The Dillards developed progressive bluegrass. In one collaboration, first-generation bluegrass fiddler Vassar Clements, progressive mandolin player David Grisman, Grateful Dead frontman Jerry Garcia (on banjo), and Peter Rowan on lead vocals played in the band called Old & In the Way. Garcia, Chris Hillman, Dickey Betts of The Allman Brothers Band and others in the 1960s and 1970s helped introduce rock music listeners to progressive and traditional bluegrass. Bush, Grisman, and Clements developed strong jazz elements in most of their playing—Clements liked to refer to his music as "hillbilly jazz"—but each owes much to traditional bluegrass. Third generation bluegrass developed in the mid-1980s. Bluegrass grew, matured and broadened from the music played in previous years. This generation redefined "mainstream bluegrass". High-quality sound equipment allowed each band member to be miked independently, exemplified by Tony Rice Unit and The Bluegrass Album Band. Tony Rice showcased elaborate lead guitar solos, and other bands followed. The electric bass became a general, but not universal, alternative to the traditional acoustic bass, though electrification of other instruments continued to meet resistance outside progressive circles. Nontraditional chord progressions also became more widely accepted. On the other hand, this generation saw a renaissance of more traditional songs, played in the newer style. The Johnson Mountain Boys were one of the decade's most popular touring groups, and played strictly traditional bluegrass. In recent decades bluegrass music has reached a broader audience. Major mainstream country music performers have recorded bluegrass albums, including Dolly Parton and Patty Loveless, who each released several bluegrass albums. Many bluegrass artists/bands went on to do more mainstream country music, including the Dixie Chicks. In the late 1990s, Ricky Skaggs, who began as a bluegrass musician and crossed over to mainstream country in the 1980s, returned to bluegrass with his band Kentucky Thunder. The Coen Brothers' film O Brother, Where Art Thou? (2000) has a country and bluegrass soundtrack which won the Grammy Award for Album of the Year in 2002. The documentary and concert film Down from the Mountain (2000) featured a live performance by the music artists who participated in the recording of the soundtrack recording. Contemporary artists such as Chris Thile are continuing the spread of bluegrass music. Famous for playing in the band Nickel Creek when he was young, Thile is now collaborating with varying diverse artists, and continues to play music in the genre. His latest band, Punch Brothers, has progressed contemporary bluegrass music through fusion with other forms and genres. Meanwhile, festivals such as the Telluride Bluegrass Festival and RockyGrass in Lyons, Colorado, and bands such as the Nederland, Colorado-based Yonder Mountain String Band and Druhá Tráva in the Czech Republic attract large audiences while expanding the range of progressive bluegrass in college jam-band atmospheres, often called "jamgrass." Bluegrass fused with jazz is found in the music of Béla Fleck and the Flecktones, Railroad Earth, Tony Rice, Andy Statman, Sam Bush, Doc Watson, and others. ^ a b Smith, Richard (1995). Bluegrass: An Informal Guide. a capella books. pp. 8–9. ^ "Bill Monroe". Bluegrass Music Hall of Fame & Museum. Retrieved September 10, 2018. ^ a b Mills, Susan. "Bringing the Family Tradition in Bluegrass Music to the Music Classroom". web.a.ebscohost.com.libezp.lib.lsu.edu. Retrieved 2017-02-11. ^ "A short History of Bluegrass Music". Reno & Harrell. Retrieved 13 June 2016. ^ van der Merwe 1989, p. 62. ^ Jargon Database.com "High Lonesome Sound". ^ a b "American Roots Music: Instruments and Innovations". PBS. 2001. Retrieved June 22, 2018. ^ Sweet, Stephen. "Bluegrass music and its misguided representation of Appalachia". web.a.ebscohost.com.libezp.lib.lsu.edu. Retrieved 2017-02-11. ^ Ted Olson, "Music — Introduction". Encyclopedia of Appalachia (Knoxville, Tenn.: University of Tennessee Press, 2006), pp. 1109–1120. ^ Goldsmith, Thomas (February 6, 2005). "The beauty and mystery of ballads". The Raleigh News & Observer. p. G5. ^ Cecelia Conway, "Celtic Influences". Encyclopedia of Appalachia (Knoxville, Tenn.: University of Tennessee, 2006), p. 1132. ^ Song notes in Bascom Lamar Lunsford: Ballads, Banjo Tunes, and Sacred Songs of Western North Carolina [CD liner notes]. Smithsonian Folkways, 1996. ^ "Bluegrass Music: The Roots". International Bluegrass Music Association. Archived from the original on April 30, 2011. Retrieved September 10, 2018. ^ "Old-Time Man" interview June 2008 Virginia Living pp. 55-7. Artis, B. (1975). Bluegrass. NY: Hawthorne Books, Inc.
Cantwell, R. (1996). When we were good: The folk revival. Cambridge, MA: Harvard University Press. Cantwell, R. (1984). Bluegrass breakdown: The making of the old southern sound. Chicago: University Illinois Press. Kingsbury, Paul (2004). The Encyclopedia of Country Music: The Ultimate Guide to the Music. Oxford University Press. ISBN 0-19-517608-1. Price, S. D. (1975). Old as the hills: The story of bluegrass music. NY: The Viking Press. Rosenberg, Neil (1985). Bluegrass: A History. University of Illinois Press. ISBN 0-252-00265-2. Trischka, Tony, Wernick, Pete, (1988) Masters of the 5-String Banjo, Oak Publications. ISBN 0-8256-0298-X.